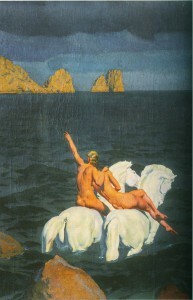 Two women thoroughly enjoy their ride through the quiet sea on their impressive white horses. The dark sky and the dark water are threatening but the two riders do not seem to bother. This painting is one of a series which Robert Pougheon (1886-1955) made in the 20s and 30s, all with the title ‘Amazone’. This subject apparently fascinated him and led him in the direction of surrealism, while he began his career in the art deco style. In 1914 he had been awarded with the Prix de Rome. We use the word ‘amazon’ for a female rider, not always realizing that the word comes from the Greek mythical tribe of martial women who conquered parts of Greece and Asia Minor, without any help of men. The martial character of the amazons is not present on the paintings of Pougheon, but their independant character clearly is.